Electronics keep getting smaller and lighter, but the Computer Recycling Center keeps boosting diverted weights each year. The key is education and outreach. Established in 2001, the Springfield, Mo.-based company is today handling about 2 million pounds of electronics, universal waste and appliances per year. It is also heavily focused on data security and provides various data-destruction services, including shredding of paper, non-paper media, hard drives and micromedia. The shredding is done both at the company’s facility as well as with mobile units at customer locations. The Computer Recycling Center’s equipment includes Cram-A-Lot balers, Ameri-Shred shredders, an American Pulverizer shredder, a Capital Shredder Disintegrator and AXO PeaShooter Shred Truck. It also has a Yale forklift, Caterpillar forklift, Navistar 26-foot box truck and Ford 14-foot box truck. The company emphasizes the testing and reuse of devices. It recycles items to recover commodities only after the data has been destroyed and reusable materials have been recovered, Westerman said. Despite its name, the company accepts a wide range of products. It takes in computers and peripherals, tablets, phones, routers/hubs/switches, office electronics, home entertainment equipment, point-of-sale equipment, white goods, batteries and more, all without charge. Additionally, it accepts CRT devices, big-screen TVs and console TVs for a $20 fee, microwaves for $10 and fluorescent bulbs for $1 each. It also provides pick-up services. 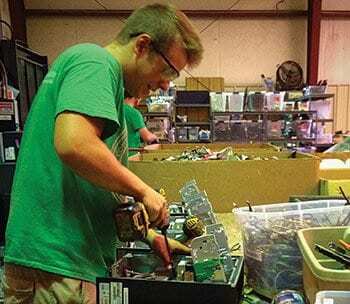 In addition to its other outreach programs, Computer Recycling Center started what it calls community collection points. Run through the state’s Sheltered Workshop program, which offers work opportunities for people with disabilities, the locations focus on taking in residential material.